Gov. 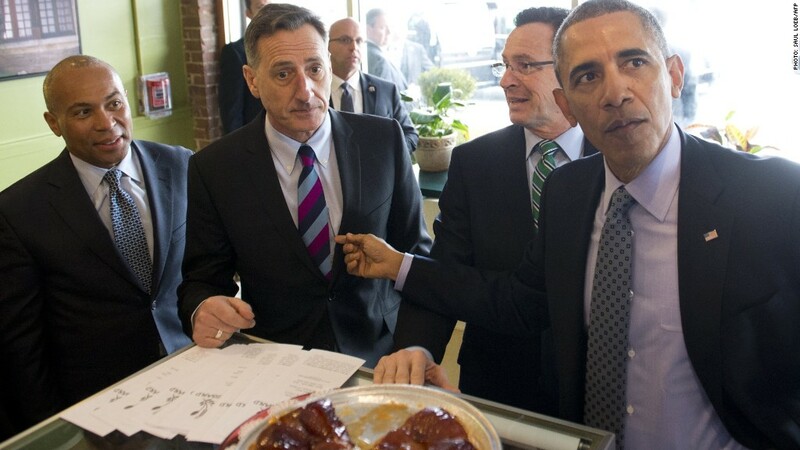 Dannel Malloy will sign the bill Thursday at a cafe where he discussed wages earlier this month with President Obama. Connecticut is the latest state to boost its minimum wage, pushing it to $10.10 by 2017. The state legislature approved the bill Wednesday and Gov. Dannel Malloy, who proposed the increase, announced he would sign it on Thursday evening. The hike will be made in steps, first from the current rate of $8.70 to $9.15 on Jan. 1, 2015. It will go up to $9.60 the following year and reach $10.10 in 2017. The move makes Connecticut the first state to match Democrats' proposal to raise the federal minimum wage to $10.10, a move President Obama supports. The President has encouraged mayors, governors and state legislators not to wait for Congress to adopt the $10.10 rate. Bills similar to Connecticut's are being debated in Maryland and Hawaii and the city of Santa Fe, New Mexico, raised minimum wage to $10.66 earlier this month. Connecticut is only one of many states that have already hiked the minimum wage above the current federal rate of $7.25. Washington currently has the highest statewide minimum wage rate, set at $9.32 per hour. Obama commended Connecticut legislators in a statement Wednesday, and at the same time urged Congress to act on the federal rate. Is a Money Market Account or CD Right for You?